Tiger Woods has seen his reputation go from one of role model and star to a confessor of "transgressions." (CNN) -- Lamar Brantley has been handicapped by Tiger Woods. Brantley runs a Web site, Role Models on the Web. Woods is a featured player. But his decision not to remove the golfer has some people incensed, he said. "I didn't feel like it was fair to pull him down because none of us are perfect," Brantley said. "The last few days, my comment box has been filled with hate mail and people telling me I should take him down. They are calling him every name in the book." 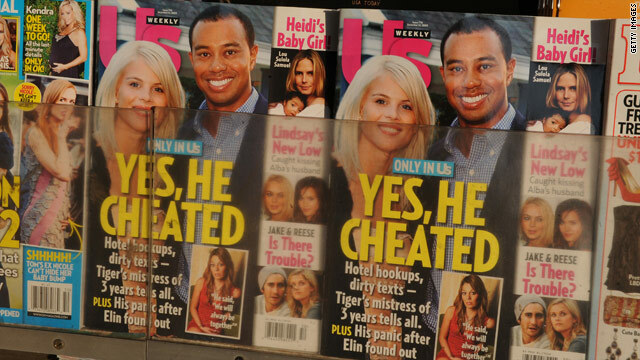 Once a darling of advertisers and a hero for his life on and off the links, Woods' image has taken a hit in the midst of accusations of infidelity with multiple women. The controversy began after a single-car accident outside of the Florida mansion the 33-year-old superstar golfer shares with wife, Elin Nordegren, and their two young children. Speculation about what led up to the accident was heightened after the couple declined to speak with investigators. Us Weekly published a story alleging that Woods had an affair with Jaimee Grubbs, whom the publication identified as a 24-year-old cocktail waitress. Woods apologized on his Web site for unspecified "transgressions." Video: Can Tiger save his image? The golfer said he had let his family down and offered fans an apology. He also seemed to acknowledge his status as a much-admired superstar. "I have not been true to my values and the behavior my family deserves," Woods' statement said. "I am not without faults, and I am far short of perfect." There was a time when many fans thought Tiger Woods to be beyond reproach. A golfing phenomenon almost from the cradle, he inspired countless young people with his multicultural background and effortless athleticism. Nike, one of his major sponsors, seized on the theme for a commercial in which children of various ages and races uttered the phrase "I'm Tiger Woods." "When you talk to kids about golf, the first words out of their mouths are 'Tiger Woods,' " said Timothy Sanders, the head golf professional at Forest Park Golf Course in Baltimore, Maryland. "His name is the first that comes to their minds." Sanders runs a junior golf program where almost 200 young people a year come for instruction. The golf course is in a predominately African American area of the city. Sanders said many of the youngsters in the program view Woods as a role model because of his talent and achievements. He hopes those qualities don't get lost in the midst of all the controversy surrounding the golfer's personal life. "I wish that everyone involved would just speak their part and let's go on from there," Sanders said. "These are things that happen in life every day, and they have nothing to do with golf." Dan Isett, director of public policy for the Parents Television Council, said Woods' story could serve as a moment for parents to impart lessons to their children about celebrities. "It's important to communicate that celebrities, and in this case athletes, are people, too, and they make mistakes," Isett said. "Just because you see someone on television doesn't mean that they are different than any one else." The elevation of athletes to role models is not new, said psychotherapist James P. Krehbiel. "I think part of it is we are fascinated with heroes because they become an extension of who we are," Krehbiel said. "We live through them vicariously, and we develop an identity based on who they are." Krehbiel said a distinction should be made between a role model, who should be emulated, and a hero, who is to be admired. "Tiger Woods would fit in with the definition of being a hero," Krehbiel said. "There's a sense of worship and adulation connected to a figure like that. Then, of course, when they fall from grace and they have their problems, somehow we try to pick up the pieces -- and in many cases now forgiveness is granted quickly and they are back up on their pedestal." John Tauer, an associate professor of psychology and assistant men's basketball coach at the University of St. Thomas in St. Paul, Minnesota, says Woods' intensely private personal life has played a role in the saga. "I think that part of the reason this firestorm has hit is that he has been so private, and often times [with] athletes who maintain their privacy, we assume don't have flaws," said Tauer, who has written about athletes as role models for Psychology Today. "A guy like Tiger Woods was elevated to the status of never making any mistakes and that's not true of any humans. I hate to say this, but we like to see people who are viewed as perfect get knocked down a little bit." Tauer said Woods' carefully cultivated image is now working against him. "He's made his bed, and no pun intended, he now has to sleep in it," Tauer said. "We reap what we sow; he's certainly helped to create this image and while I think he has every right to ask for privacy, everyone else has a right to be intrigued with the fact that maybe this guy isn't as perfect as we thought." Brantley, who in addition to running Role Models on the Web is an ordained minister, said countless people have come to his site over the years looking for information about Tiger Woods as a role model. Children from across the country use the site to nominate their personal role models and share their feelings about what a role model means to them, Brantley said. Brantley said he believes Woods will now be more admired as an incredible golfer than as a personal hero. But Brantley said he will continue to take the stance that Woods, whom he has never met, shouldn't be disqualified from admiration simply because of his errors. "I hope [Woods] appreciates me taking the brunt for him here," Brantley said laughing.